Spend more time outdoors with a DIY wood fencing kit and create a beautiful addition to your property. Spring is officially here. Are you looking for a good excuse to spend more time outdoors? Not sure how to utilize that extra hour of sunshine Daylight Savings Time granted us? Looking for your next DIY project? Mid-Atlantic Deck and Fence has your solution! Our DIY fencing kits in Maryland are a great home improvement project to take on, and one that your property will benefit from for years to come. Let us elaborate about your options from Mid-Atlantic Deck and Fence. We offer a boxed vinyl railing program. Our vinyl railing kits are supplied with Kroy buildings products. The equipment is high quality and comes with the best limited lifetime warranty in the industry. Check out our vinyl railing catalog. We will ship our vinyl railings anywhere in the United States. Order yours today at 1-800-833-9310. We also offer vinyl fencing kits in several styles. We offer vinyl pergola kits that are incredibly simple to install. Our vinyl pergola kits are constructed with the highest quality vinyl components on the market. The best part? They include a limited lifetime manufacturer warranty against fading, blistering, yellowing, chalking, and cracking for as long as you own your home! Learn more about our vinyl pergola kits here. We offer wood fencing kits in an assortment of material options including pressure treated southern yellow pine and western red cedar. 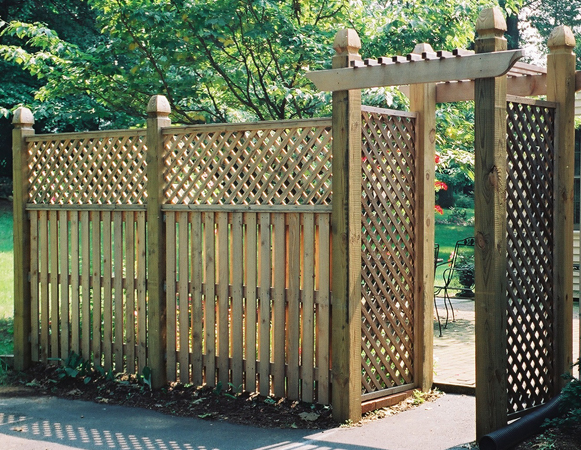 Our wood fence styles are offered in assembled fence sections for simple installation. Our cedar fence material is incredibly popular due to its stability and resistance to rot decay and termites. Check out our wood fencing catalog. We offer high quality and reasonably priced aluminum fencing products. 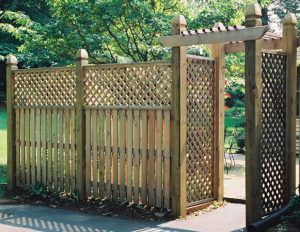 Our DIY ornamental aluminum fencing kits are backed by a lifetime manufacturer warranty and available in five different colors: black, white, beige, green, and brown. We use TGIC polyester powder coating technology that provides twice the thickness and hardness as the powder coating process. Please call us today with your questions at 1-800-833-9310 or email sales@madfence.com. Are You Ready to Talk to Someone About Your DIY Fence?